This is block 4 designed by Jennifer Fulton the inquiring quilter. Jennifer has called her block Christmas Memories. The instructions and downloadable pattern for making this block is over at Jennifer's blog. It's a sweet block made of applique pieces, with detailed instructions from Jennifer on how to construct it. This is my version of the block. Tracing the pieces onto fusable web making sure each one is labelled to make placement easier! This is the first step after cutting the shapes out in the selected fabric, making sure the right baubles are in the right order. All the pieces are now in place ready for the finish. I have decided this time to use the raw edge applique method to sew the pieces down. I rarely use this method but there were so many small edges in this block design I felt this was the best option this time. One disadvantage of using raw edge applique is that the edges of the pieces are in danger of fraying with use, although sometimes this can actually enhance the pieces too! 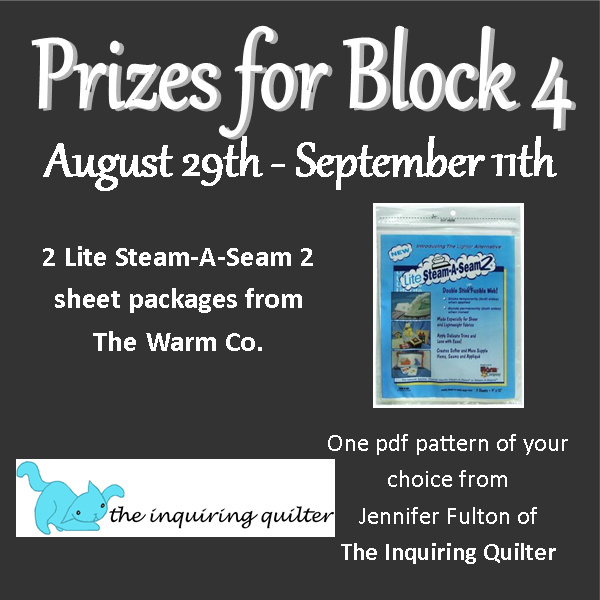 By sharing your block you can be entered into a prize draw to win one of the following prizes!